Because, really, why the hell not? I'd do it in a heartbeat. Bring it on. Lotteria is once again releasing a truly unusual burger. This time, it's high-grade Japanese beef with a strawberry cream sauce slathered on. Um, yum! The type of the strawberry is called "tochiotome" (とちおとめ), and it's variety of strawberry grown in Tochigi Prefecture that is famous for its perfect balance of sweetness and tartness. 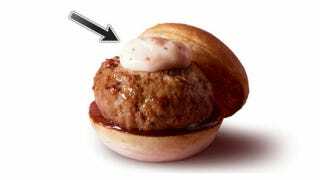 Besides a thick patty of Tochigi beef, the burger has a rich demiglace sauce made from red wine-type flavoring, boulin, and apple. There is also a white sauce made with the tochiotome strawberries, supposedly giving the burger a rich aroma and a deep, rich taste. Yes, this is a gourmet burger... from a fast food chain. It could taste totally bad. But a strawberry sauce burger doesn't sound to bad to me! The hamburger goes on sale in Japan later this month. It's priced at 1,300 yen or US$11.90.